RapidPure Intrepid 1.2L Water Bottle Filter is 2.5in and comes with the Nano Filtration Technology designed for drinking water purification system. Each filter comes with two straw connectors which allow a single RapidPure assembly to fit three different straw diameters without reducing ID of straw. 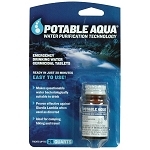 The pre-filter wrap is washable to remove large sediment build-up and extend sub-micron filter life.